In recent a recent 2–part article, Resistance-Free Performance, I discussed Resistances and their relationship to training where I briefly mentioned something called “braces”. Since that time, my e-mail has been flooded with readers wanting to know more about them. Because your ability to recognize braces is an important part of alleviating your horse’s resistances, I am dedicating this article toward a greater explanation of this subject. The Lack of correct, full, voluntary, and unimpeded movement in any able direction, demonstrated by a smooth, tension-free, and willing response on the part of the horse. For example, a horse who does not step as deeply under his body on one side would be seen as manifesting a brace on that side. It is the effect of the brace that is often noticed, such as when we see a horse half-pass well to the right and not so well to the left. The actual origin of the brace needs further investigation. This type of brace is usually the easiest to observe and the easiest to correct. 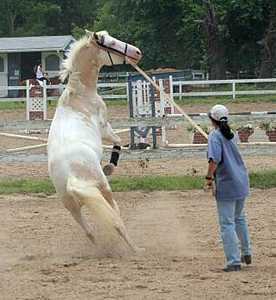 Commonly, they include the horse’s inability move freely through the shoulders (I.e. step forward, sideways, or backward on a 45 degree angle) or hind quarters (i.e. step deeply under and across the body). Decreasing hind end braces improves impulsion, straightness and engagement. Decreasing front end braces improves lightness of the shoulders, carrying capacity of the hind quarters, self-carriage and collection, (Of course, all braces are related as the horse moves as a single unit, each part affecting the others in a positive or negative manner.) Unfortunately, not all braces are simple. Braces usually observed at higher levels of performance and often originate from compromised ability of the horse to move hind end around the front end, and the front end around the hind. Often involves some spinal component (not necessarily a physical problem; more commonly a training issue i.e., lack of spinal rotation or bend at some level). Group 3) Complicated braces Some braces are compensations for other braces. These braces can be found anywhere in the body, and are often the result of a combination of more than one brace. Here are some more examples of the effects of a brace: horse falling on his forehand, dragging one or more feet when backing, uneven Piaffe, crooked to a jump, difficulty in bending on one side, etc. A breakdown at the higher levels of riding can often be traced back to a flaw in the foundation, and this is usually the consequence of a brace. 3 ─ address it to make a change in the horse’s movement and his response to the aids. 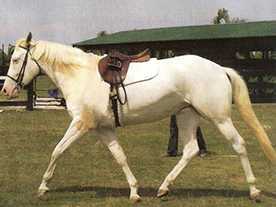 For example, your horse demonstrates right lead canter problems. This might be the result of a simple left hind brace, or a complex right sided brace in both the right hind leg and the ribs. We might address these braces by either health care intervention or re-training, depending on our diagnosis. Performance and movement problems are often the result of a brace. In other words ─ “alleviate the braces” to improve performance.